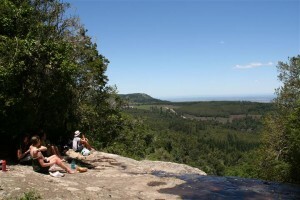 I recently (Nov 2011) had the opportunity to hike the Amatola Hiking from King WIlliams Town to Hogsback. A group of five other engineers and two BSc graduates made for great company along the 100km we covered in 6 days. Each day’s route leads from one hut to the next. Five huts in total provided us with a warm place to rest, a reasonably soft bed to sleep on, and somewhere to cook. 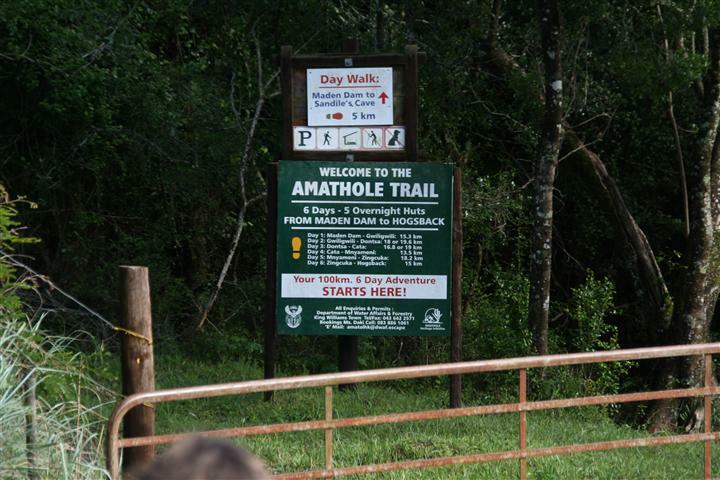 The Amatola trail is rated as one of the toughest hikes in Southern Africa, and although I’m a fairly bad judge of such things, I am quite likely to accept other people’s opinions on these matters. It must be said that it is an extremely beautiful hike. 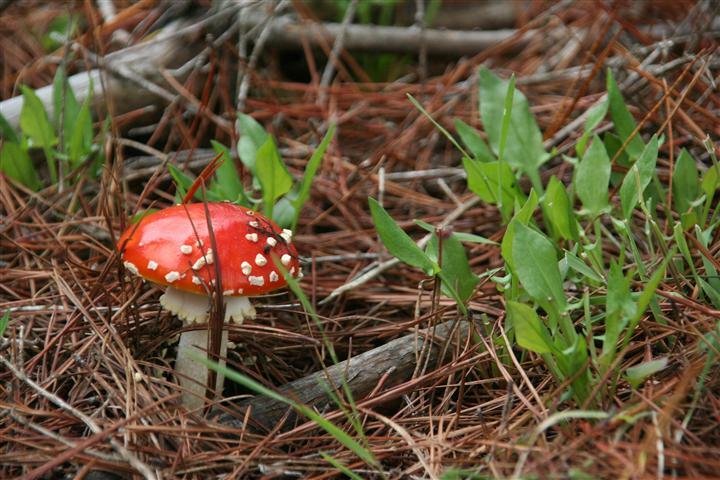 Majority of your progress is made through natural forest which reveals the widest variety of fungus you’ll ever see along with splendid displays of waterfalls. 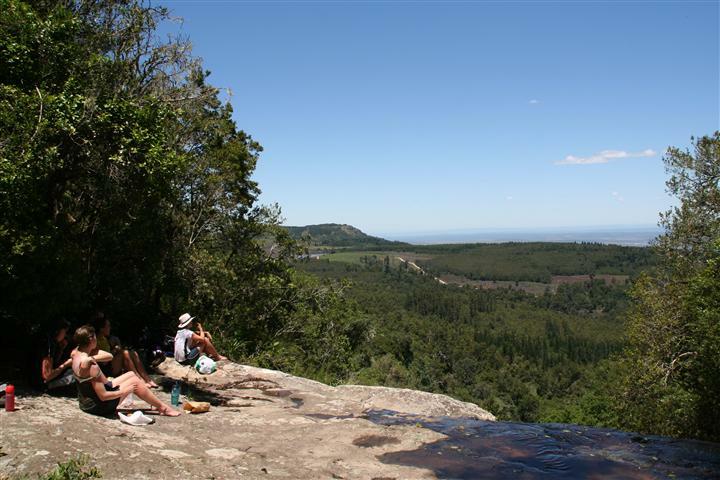 We drove up from Stellenbosch, spending the night in a backpackers in PE (Lily Pond Backpackers – good facilities, well priced), and then heading on to Hogsback to spend the night before the first day. 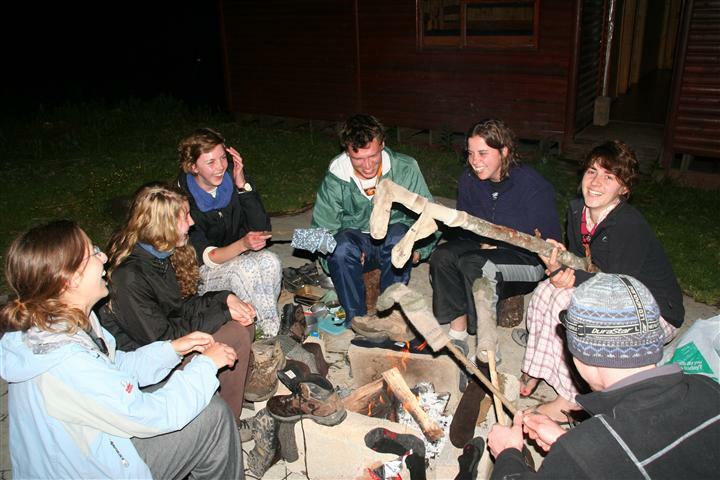 Both the night before, and after the hike we spent at Away with the Fairies Backpackers in Hogsback, quite nice huts, although the geyser didn’t make it halfway through our group when we finished the hike. That being said we did have warm water in the morning again, and the rooms were well kept and clean. We caught a lift with a guy called Lawrence who picked the eight of us and our gear up at 6AM in Hogsback and dropped us at our starting point just outside of King William’s Town. After having driven up in pouring rain and going to sleep with thick fog, it was nice to wake up to some slightly overcast weather. We carried a fairly nice map which displayed the various paths one can follow along with estimated times to complete. Day 1 was supposed to be about 16km, but we think we somehow managed a route less than 12km, as we did fairly amazing time to the first hut (Gwili-Gwili) arriving some time before 1PM. On arrival we were greeted by cleaners busy neatening the hut and a man tending to the fire of a hot water donkey. In the past it seems that some huts contained gas water heaters or other apparatus, but when we did the route each hut had a standard fire heated donkey. So day one ended fairly early and with nice warm showers for each of us. The huts themselves were generally in fairly good order. All of them are built from wood, and generally hidden from view by the surrounding forest. Most had some form of outhouse and shower facility. 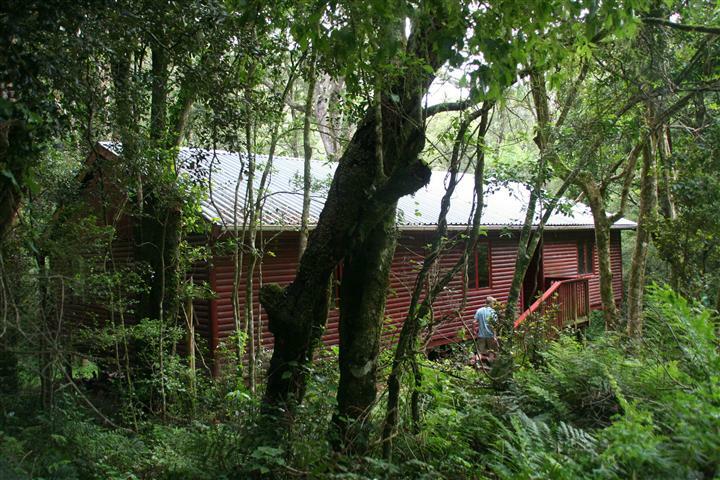 Gwili-Gwili itself had a four showers and two long drop toilets and a lovely braai area under cover. Day 2 was overcast from start to finish. We opted for a slightly shorter route which skipped a waterfall. On arrival at Dontsa Hut, signs indicated that the waterfall was a mere 0.8km away, and so several of us went for a swim below the amazingly beautiful, and amazingly cold waterfall. 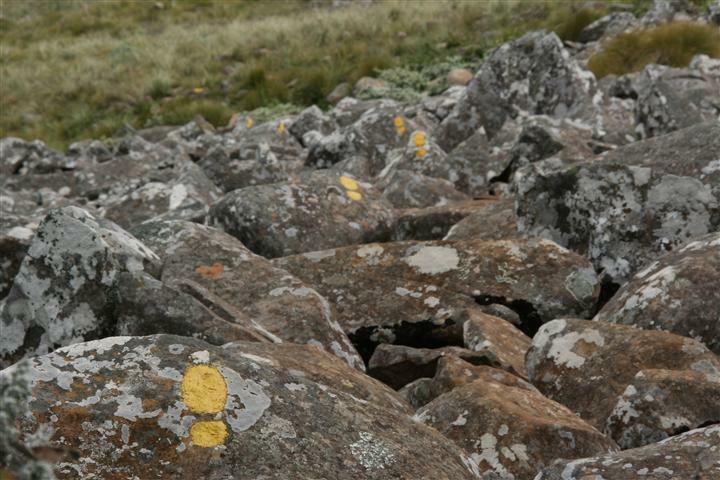 Two flushing toilets were located about 200m from the hut, and a single shower linked to the donkey was available. The only problem was the wood provided was extremely wet, which resulted in fires that were difficult to maintain and only slightly not cold showers. This ended up being a repeating theme throughout the hike. Each hut had a large axe (often chained to the ground) and an ample supply of wood, but it was generally too damp to make any type of successful fire. Day 3 lead us on to Cata hut. A fairly long, overcast day, uneventful for the most part. 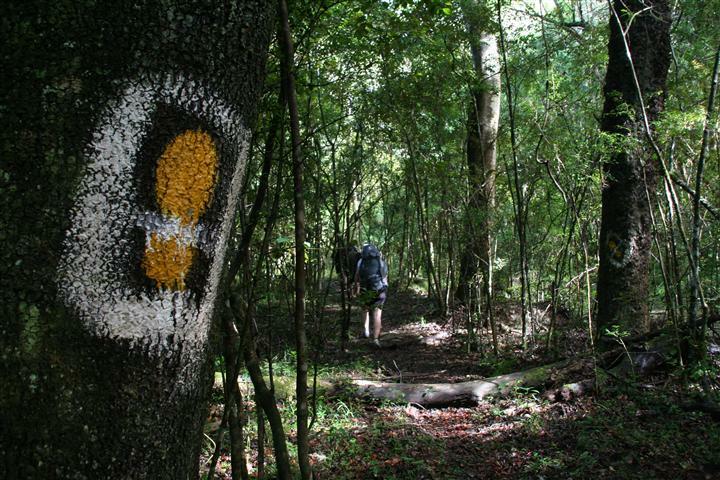 The last few kilometers are covered on a jeep track, which ends down in a valley where the hut is located. The hut is fenced in along with the other buildings, but the exact time line and planning involved in the building seemed to be absent from anyone involved’s knowledge. Again lukewarm water showers were had, and shortly after we arrived a drizzle set in. Later that evening the rain started to pour down. And we had a spectacular thunderstorm with an amazing amount of rain, causing the water tanks to overflow. The huts and shelters provided lovely dry places to cook, eat and sleep. Although you cross rivers quite a few times throughout the hike, up until this point I had managed to keep my socks dry, mainly due to my determination to jump over as many loose rocks as I needed, and aided by the slight water-resistant abilities my hiking boots possessed. 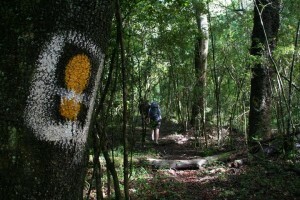 But day 4 was a lot of walking through long grass, and within the first 5km my socks were soaked. Throughout the hike the path is fairly well marked, a continuous strew of yellow footprints ensure that you know you’re on track, and, especially through the forests, the paths are fairly well worn. After the first few kilometres on Day 4, there is a split. A shortcut which heads straight up the mountain, or a longer, slightly flatter route which takes you up the slopes of a nearby hill. Apparently everyone takes the shortcut, as we got lost for what probably amounted to an hour over the next 5kms as we repeatedly lost the track. Even though it was further, and we lost the path several times, I was extremely glad we took that route, as it takes you past one of the highest points in the area, which allows you an amazing 280 degree view of the surrounding area and valleys. The day ended at Nmyeni hut. While hiking you are constantly surrounded by the sounds of birds, but it is rare to ever see one, or so we found. 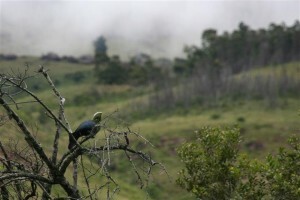 On arrival at Nmyeni hut, we were greeted by our first proper sighting, that of a Knysna Lourie, it was short lived, but we managed a few photographs. The hut had a couple of windows that had been smashed out, glass was lying around and rubbish bins had litter strewn around them. The shower and toilet facilities weren’t that nice either, and for once we decided to give trying to make a fire for the donkey a complete skip, and we all bathed in a nearby stream. The next day we woke up to beautiful sunshine. The first 4 days had provided little sunshine, mainly being overcast, if not drizzling. Day 5 held a few lovely swimming spots, and it was the first time anyone had really wanted to jump into the rivers. The sun also brought about our first encounter of a snake. 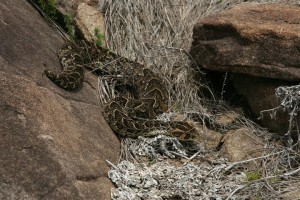 A beautiful fat Puff Adder which lay in the middle of the path. Myself and one of the guys before me both stepped right over the snake without noticing him, before the person behind me spotted the snake and made a well calculated detour. We stopped and took a few photos, but he seemed fairly rustig, although the two of us who stepped over him were quite fortunate not to have upset him too badly. 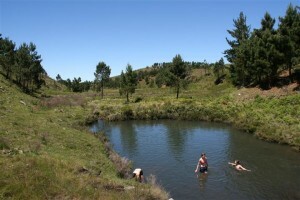 Another swim, and an extremely steep descent into the forest ended us at our last hut (Zingcuka). It was very nicely laid out, with two showers and a long drop a slight way off. The hut itself was beautifully located and a nice braai area was also provided. Instead of trying to achieve anything with the provided wood, we went hunting and took down a few dead trees which we chopped up for the fire. The fire provided us with lovely warm water for our final night. A bottle of sherry that two of the girls had carried the previous five days also did not go amiss. The last day was also to be one of the longer ones, and once arriving at the end of the hike, still required a 4km walk back to town. We had been getting up between 6 and 7AM the previous days, and generally leaving about 7:30, but we decided for the last day to get up at 5, and ended up leaving at 6:10. Day 6 has a section of about 8km without water, which was fairly tough in the warm conditions that we did it in, but when we eventually stopped for lunch at a waterfall with a spectacular view at the 13km mark, it was most welcome. From there it was a fairly short hour to the end point! 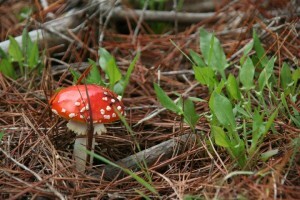 Once we’d taken some photos we headed off down the road back to Hogsback. About 700m later a truck came passed, and with eight thumbs sticking out, we successfully managed a grateful lift back to Hogsback where our first stop resulted in beers and ice-cream all round. 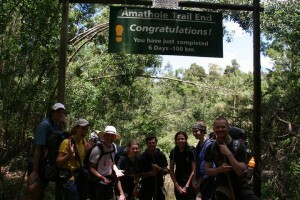 We ended up back in Hogsback some time shortly after 13:00, which was a nice reward for the early start. After everyone had showered and had a bit of a snooze we all went out on the town to a lovely little pub/restaurant/hotel known as the Hogsback Inn. They provided great meals, delicious food and at a very reasonable cost, would definitely recommend giving them a visit. The hike is managed by the Department of Water Affairs in King Williams Town, contact details can be found here (Eastern Cape office). 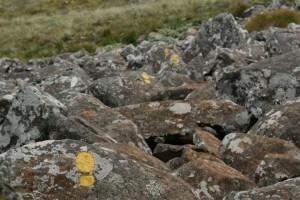 The cost is generally R750pp for permits and a map for the 6 day route. Students apparently hike for free, which was great news for us. For more information on the hike have a look here, here and here (fairly old post). “Julle’s die mooiste mense!“, that’s the way my ride started off on Sunday as I completed my first Karoo to Coast bike ride. It’s 100km of almost purely dirt roads that takes you from Uniondale up and down the mountains to end off in Knysna. 100km is a long way, and my constant self-reassurances that it must all be downhill (seeing as we started at 700m and ended at sea-level) did little to help when all the climbing occurred. Something that did help was the beautiful scenery, spectators with cheers of support, water points and a stunning 14km down hill. 14km. Of down hill. It was great! Although the road wasn’t closed to traffic we were very lucky, along the entire 100km, I probably only encountered 2 or 3 non-official cars. This makes life on the down hills much nicer. Speaking of down hills, and up hills for that matter, and puddles, this is my only complaint, however it is not at all unique to the K2C. I’m not the fastest climber, and as such I make a point to keep well left and out of the way of the faster riders. I’m also slightly paranoid, and constantly check around em to see where people are. If I want to pass someone I check to see I won’t get in someone’s way and I make a dash. All I want is for other people to do the same on the downhills. Downhills are where I can make up all the time I lost on the uphill. 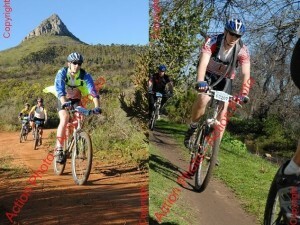 I’m comfortable going fairly fast on the downhills. It’s fun, but when you’re coming down and getting held up the whole time it get’s annoying, especially people who don’t hold their lines through a corner. Obviously cutting corners is the easiest way to get down fast, and I do it often, but I make sure I won’t be cutting someone else off. Most of these problems are just an issue of too many people in the same spot, and is, I guess fully understandable, and I accept them as part of cycling, but it would be nice if they weren’t there. In any case I cycled the full route with my dad and we finished with equal times of 05:36:08, nothing amazing, but I was quite happy with it. He did somehow manage to grab the position in front of me, us finishing 816 and 817 of 1987 finishers. The cutoff being 8hours. We also stopped for a nice swim in a river along the way to cool off on what was a rather warm day. Although the race started in Uniondale, we spent the night at a nice B&B in de Rust, I believe the place was called Riverside or something similar. We had lovely pizza the previous night at the backpackers in de Rust whose restaurant is apparently only open on Fridays. 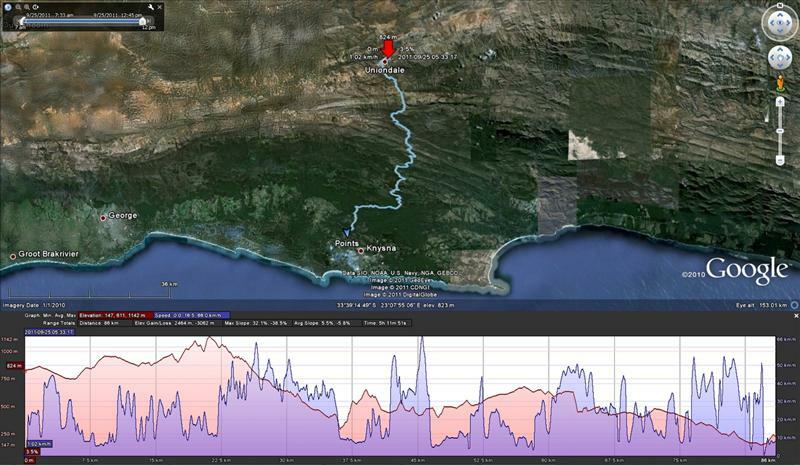 Included in this post are the logs from my GPS which I carried along, and which managed to die 15km from the end. Max speed clocked out at 66km/h. 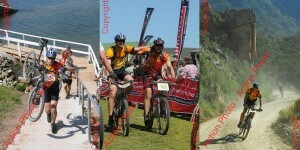 Overall had a great ride on a spectacular route and look forward to doing it again next year. 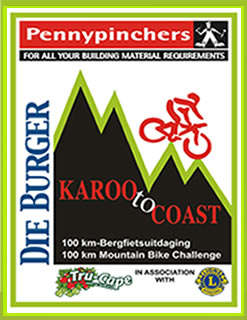 Just a quick congratulations to the organisers of this year’s Die Burger Mountain Bike Challenge Stellenbsoch. It was such a nice ride, well marked out and only one or two short sections of congestion. There were quite a few distances on offer, and I went with the moderate 42km ride. 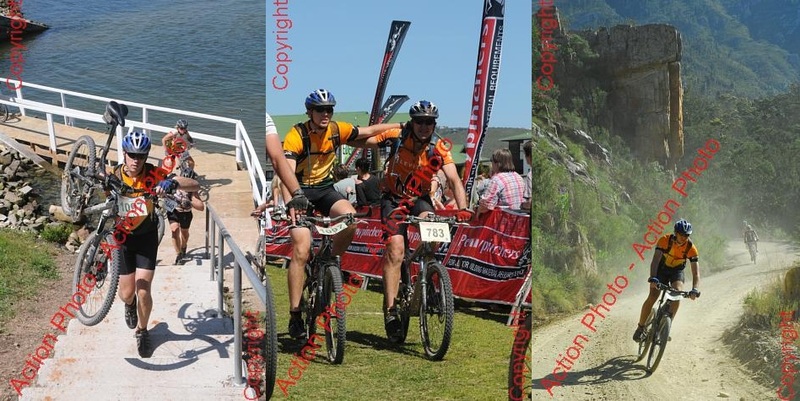 Starting at Eikestad Primary School, we made our way up through Coetzenberg and road around the base of Stellenboschberg before cutting down by the hangbrug and across the Jonkershoek road and up Botmaskop. Quite a bit of a climb here as we road across towards the Helshoogte Pass. This was the first congestion point, as everyone had to walk along a small single track section before getting off their bikes to cross the Helshoogte Road. Our route then followed the old Helshoogte Pass and we road around a bit on the farms below Simonsberg. Riding out towards Welgevonden we crossed the R44 and made our way up towards Pappegaiberg with our second long climb. 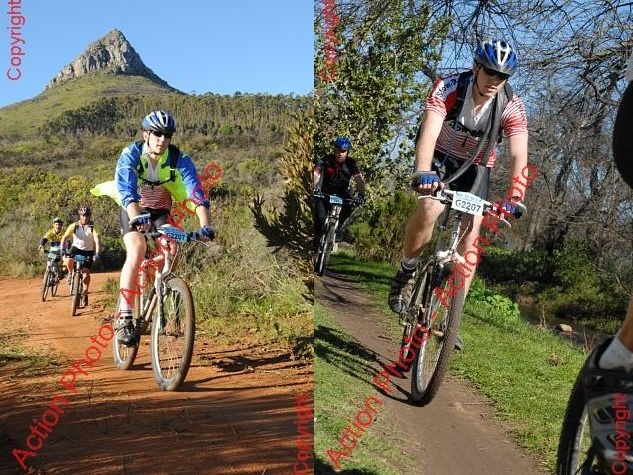 At the top we road along and down the other side into Stellenbosch. This is where I was unlucky enough to suffer a “snakebite” puncture, going straight through both the tubes in my back wheel, forcing me to stop, take the spare tube from the front wheel and put it in the back. Once I got going again on the down hill, I quickly noticed my lack of brakes, which I had failed to reconnect. No worries though, some careful shoe-tyre action resulted in me coming to a stop before I picked up too much speed. Anyway, through the town a bit on some odd “offroad”/pavement sections and we were once again back at Eikestad Primary. It was one of the nicest rides I’ve ever done, beautiful scenery and kudos also to all the cops/marshals sitting at the road crossings, they meant we never had to stop, or worry about crossing the roads. Will definitely be doing this one again next year. This has nothing to do with squash as such, just the way it is managed, and the way I want it to be managed, mainly with regards to access to information. I happen to be in East London at the moment, and coincidentally the 2011 Jarvis & Kaplan tournaments were being held here too. These are basically the men’s and women’s inter-provincial tournaments. It’s a fairly large event as far as squash tournaments go, but do you think I could find any information about it? Searching the internet found a very nice article on Gauteng Squash’s website that gave a brief history and explained a bit about the tournament in general but nothing specific to this year’s tournament. Going to Squash SA’s website also provided some information but not much. It had two letters sent out by Border’s organising committee, but again no fixtures or locations. I did then decide to try Border Squash’s website. A quick search revealed that they did in fact have one, and there was a nice link for the Jarvis/Kaplan cups. Clicking on it gave a page with a list of fixtures, exactly what I had been looking for, apart from one thing. These were dates and results for 2004. Today I went to one of the clubs and managed to catch the last of the WP vs Border match. There were no boards up with results or fixtures. I eventually found an office where a lady was kind enough to photo copy me some of the fixtures, but this is all information that should be readily available. I don’t think I’m unfounded in my disappointment. Sure we’ve been spoilt in the last years, the internet making information available to us whenever we want, but that’s the norm, that’s the way it should be. If people want to build up a sport or event, the internet is where to do it. Everyone has access to it, and it’s easy.